As I stated last week, I’ll reluctantly accept the blame for making no preparations whatsoever. Being as lazy as I tend to be sometimes I rarely proofread), I believed that just picking up the phone would suffice. This seemed to be a safe route to answering questions, some of which were collected in advance to be directed at opposing sides (more information on this will possibly come in a followup post). ”I was merely invited to the podcast and it was Jeff who planned everything and had peers arrange it.“Since it was not necessary, I wasn’t prepared (nor willing) to make any planned and properly-structured statements. I was merely invited to the podcast and it was Jeff who planned everything and had peers arrange it. Rambling was to be expected if awkward silences were to materialise in the podcast (and indeed, Jeff was absent for a very, very long time). The session was plagued with technical difficulties and suffered from poor planning (no concrete and complete agenda). I’m pretty sure, though, that Waugh will leave a comment below, questioning why he wasn’t asked for input about this article – before he lets off steam against me (and not the points made in this piece) on a members-only mailing list. Last time it was the Open Source Industry Association mailing list. GNOME has a great many strengths – but one of its major weaknesses is having a media spokesman who does not know the difference between news and comment. He makes the Foundation look very amateurish. Sam’s analysis aligns perfectly with E-mails I’ve received since the podcast. There are some interesting (maybe over-the-line) reactions in LinuxToday, including this one, which rubbed some people the wrong way. Do they want to alienate most of the open source community? If that’s their goal then I must congratulate them: They really are succeeding. In that case there must be virtually no genuine journalists, because that happens all the bloody time, especially in politics. BTW, Sam Varghese insists that (KDE takes stand on OOXML; GNOME dithers ) the KDE folks “deserve a round of applause” for having expressed their opposition to OOXML, whereas the GNOME guys… uh… the GNOME guys… they have screwed the podcast with Roy Schestowitz! The show_119922.mp3 (13.7 MB) proves that Robin Miller and Bruce Byfield were obviously on the side of Jeff Waugh, which is obviously defending Miguel de Icaza (who has just finished speaking at the Microsoft-sponsored conference XML2007)! Have I mentioned that BB is eating that thing? After Mono, and now OOXML, what’s next? Red Hat should realize that, should they not fork GNOME while they still can, they might be unable to build a “clean” GNOME for RHEL6, as GNOME might get very trickily tied to Microsoft by then! Some said I was cornered in the podcast (being unprepared and nonchalant didn’t help either). Others said that it was bad crowd and that they were possibly portraying the ‘minority’ as “extremists” who are driven by hate of Microsoft. There were those called it a set-up or an ambush. I’ve always calmed down desktop environment flamewars until they were quelled. I even advocated GNOME, but the multiple identities in GNOME have become a cause for concern. If GNOME does not stand up soon and joins KDE’s stance, the project will get in serious trouble. In a sense, it is already too cozy with Microsoft because Novell plays a role in this relationship as well. True separability here is not likely to be approached because Novell is bound by Microsoft’s terms and at the same time it commits changes to various projects. This does not just include Mono. We mentioned and predicted that a year ago in the context of OpenOffice.org. Remember Holland's decision to adopt OpenDocument Format (ODF)? Well, as long as you have many people on Microsoft’s payroll (or blood supply, as in the case of Novell), no policy favourable to OpenDocument will be tolerated. Just ask people who lost their job over it. Anyway, Holland is no exception. Have a look. Proposed legislation that would mandate the use of the Open Document Format (ODF) across the entire Dutch government has infuriated Microsoft. It isn’t the first time that we mention cases where Microsoft money is being used to combat OpenDocument format. This is unacceptable. Meanwhile, Microsoft’s Platform Strategy Manager in Germany talks about Office Developer Conference discounts as well. OpenDocument is all about fair competition. Novell has released two security updates, the first of which closes a hole in Novell NetMail which can be exploited to compromise a system running version 3.5.2 of the software. The second update fixes three vulnerabilities in Novell BorderManager 3.8. The most serious of these vulnerabilities involes a flaw in Novell Client Trust. One might argue that Novell does not keep its eyes on the ball, either. Ever so often, I make it a point to glance at the upcoming advisories from TippingPoint’s Zero Day Initiative and wonder about the status of these “high risk” issues that are more than 300 days old. Enough damage done with OOXML, but what about patents and trademarks? This item is a short analysis which brings together many previous posts. DisinformationWeek presents an interesting story. It writes about Microsoft’s reluctance to talk about UNIX assets. For months, I’ve been trying to get Microsoft to answer a few questions about the Unix technologies in its intellectual property portfolio. Microsoft agreed to an interview, then backed out. So the question remains: How much Unix code does Microsoft have its hands on? We wrote about such issues before, so it’s worth cross-citing rather than repeating. Novell may be the owner of what SCO claimed to be its assets, but this might actually be very bad news. Novell is very Microsoft-dependent and Microsoft uses Novell as a proxy for fake support, among other things. Novell can almost be treated as a Microsoft player inside the Free world. ”It also became clear that Novell keeps losing its talent, which can’t be good for its morale.“Novell’s financial situation seems to be more grim than people from the outside realise. Shortly after the SEC’s recent investigation into Novell’s accounting practice (last Wednesday) came a ’round table discussion’. In last week's podcast from the Register, for example, it became more clear why Novell ran begging for Microsoft money. It also became clear that Novell keeps losing its talent, which can’t be good for its morale. Last year, a month or two after the Novell/Microsoft deal, I asked myself whether Novell was to inherit SCO’s assets (including the bad ones). Shane later asked himself, "Is Novell the New SCO?" Microsoft’s OOXML poker. Here is its hand. Back in August we argued that Microsoft had gotten itself a puppet state. It is able to buy support for OOXML from other companies. In other case, it uses blackmailing technique (e.g. patent terrorism) to get that support. We backed this assertion with a reference from Wikipedia. Earlier today, the No OOXML site echoed this assessment and presented the same type of analysis. It shows that indeed, Novell is a puppet. Wikipedia: “A puppet is a representational object manipulated by a puppeteer. It is usually but not always a depiction of a human character and is used in (a) play or a presentation. The puppet undergoes a process of transformation through being animated, and is normally manipulated by one, or sometimes more than one, puppeteer. 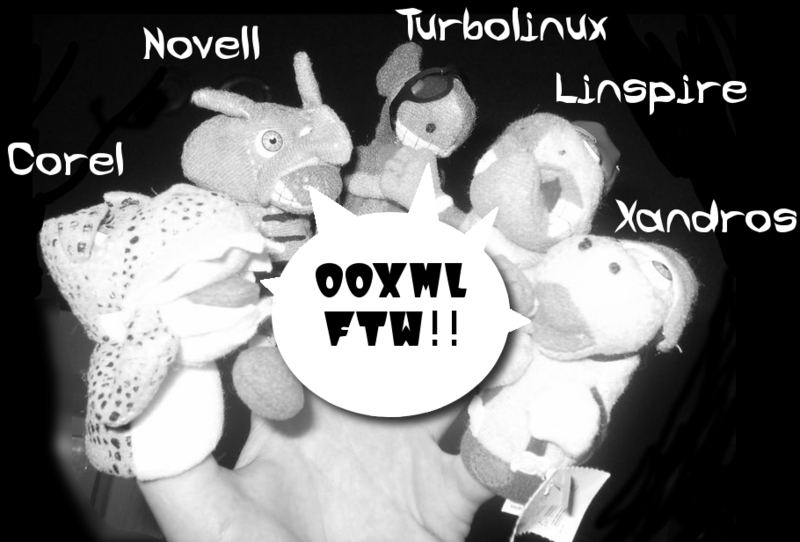 Some puppets can be moved electronically.” Does Novell qualify as an OOXML puppet? It does indeed. Novell has a good track record of doing things that please Microsoft. It is a Microsoft puppet in more than one way. (a) *** will exercise its *** to *** by no later than *** that (i) the *** OpenOffice (version 2 or later) *** does or will *** Office Open XML format (“Open XML”), and (ii) it will make a *** *** If *** does not *** it will *** within the same time frame that *** in the *** on a*** to *** Open XML. *** will provide its *** to*** at least *** in advance of *** The *** will be *** not to be *** will provide *** in the *** will *** of such *** the Term, including through *** in the *** is defined in the Business Collaboration Agreement. (b) Novell Product Support for Office Open XML. No later than *** after the Translator Project makes generally available a version of its translator for word processing, and thereafter throughout the Term, Novell will (unless commercially impracticable) make prominently available *** for word processing documents. The *** can be made prominently available to a user of *** via an easily available download or by distributing the *** with each copy of a *** . No later than *** after the Translator Project releases a final version of its translator for spreadsheets, Novell will use commercially reasonable efforts to include in the *** support for spreadsheet documents. No later than *** after the Translator Project releases a final version of its translator for presentations, Novell will use commercially reasonable efforts to include in the *** support for presentation documents. Once released, Novell will continue to make the *** commercially available for the Term. If, during the Term, the Translator Project releases an updated version of its translator to reflect a new version of the relevant ODF or Open XML specification, then no later than *** following such release, Novell will use commercially reasonable efforts to make prominently available a corresponding update to *** . (c) Spreadsheet Translator Prototype. If the Translator Project announces that it will begin development of an open source Open XML-ODF Translator for spreadsheet documents (“Spreadsheet Translator”), within fifteen (15) days after that announcement Novell will review the terms applicable to contributions and determine at its discretion whether it is appropriate to submit its existing prototype of a Spreadsheet Translator to the Translator Project on the same terms that apply to other contributors to the Translator Project. Novell will also participate in the Translator Project by periodically testing subsequent versions of the Spreadsheet Translator and providing other feedback. (d) Microsoft-Facilitated Translator Development. Microsoft will use commercially reasonable efforts to encourage development of Open XML-ODF Translators for spreadsheet and presentation documents. Novell will participate with Microsoft in such efforts at a commercially reasonable level. In addition, subject to Novell’s foregoing commitment to participate, Microsoft will manage an open source software project (which may be the Translator Project) to develop each such Translator, similar to the manner in which it currently manages the Translator Project, commencing when and continuing for such period as Microsoft reasonably deems appropriate. The translators resulting from any such project(s) will be made available under an open source license, similar to that currently being used in the Translator Project. As you can see, Microsoft set the rules for Novell. Microsoft offered Novell a huge cash infusion and it wanted something in return. In essence, Microsoft used money to make Novell its marionette. Novell (and GNOME) could truly take a lesson from KDE, which has truly remained idealogical and pragmatic. Three cheers for the developers and management of the K Desktop Environment. They have taken a principled stand on the divisive issue of OOXML, the Microsoft Office Open XML document format. And for this the KDE folk deserve a round of applause.